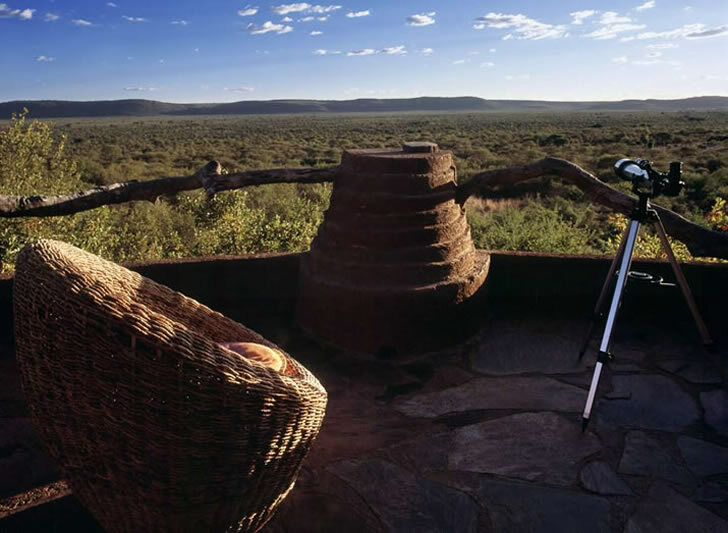 Every visitor to Madikwe Safari Lodge will have his or her own defining �bush� moment. For some it may come from catching a glimpse of a family of endangered wild dogs, tracking a pride of lion from an open-top 4x4 at dusk or the awe-inspiring thrill of observing a herd of elephant close up as they cool down in the mud of the nearby Marico river. For others it may be as simple as watching the sun rising over the Dwarsberg mountains or retreating to one�s private deck to eavesdrop on the nocturnal sounds emanating from the plains that unfold into the distance. 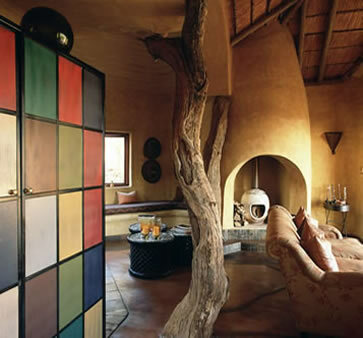 The lodge, with its rustic-hideaway quality, is located in the malaria-free Madikwe Game Reserve in South Africa�s North West Province, a region boasting several richly diverse habitats that are positioned at the ecological junction between the bushveld and the Kalahari. 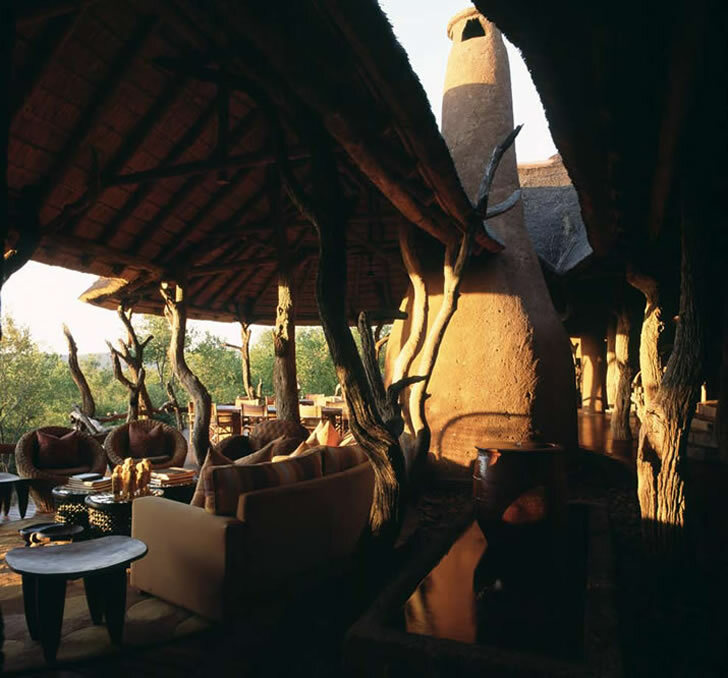 Like the gnarled leadwood, fig and bushwillow trees, grass-tufted koppies and crooked termite mounds so ubiquitous in the landscape, the adobe-style buildings of Madikwe Safari Lodge seem to have simply taken root and grown into place. As in nature, straight lines are nowhere to be found in the sturdily shaped structures fashioned from thatch, roughly hewn stone work and Cretestoneplastered walls that have been tinted in earthy colours, rubbed with wax, and �toasted� with a blowtorch to lend notes of texture. The layout of the lodge � consisting of three intimate camps totalling 20 suites with plunge pools, and a series of guest areas � eschews a traditional sequential arrangement in favour of a blueprint provided by the animal inhabitants of the land. �Before beginning the design process,� explains architect Rob Marnewick, �I spent a lot of time just getting a feeling for the site. I followed the old animal tracks to the places they used to rest at night. These nodes functioned as the animals� amphitheatres, where their backs were protected and they could look out. The positioning and layout of the guest suites � thoroughly screened from each other for privacy � and the public areas evolved from there. 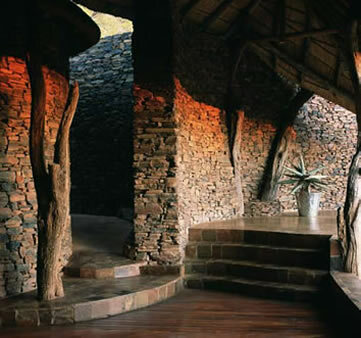 One experiences the building from the inside looking out, essentially like a series of verandas in the bush.� Also seemingly inspired by the idea of the animal shelter, a series of tucked-away niches in the public areas provide quiet spots to which guests can retreat. An emphasis on sculptured organic forms and rustic materials serves to firmly place the buildings in the environment without impacting on it. Even the immediate surrounding vegetation has been left untouched in order for the man-made structures to fully connect with nature. Marnewick went �bush shopping� to source most of his materials, including the dramatic leadwood posts that feature throughout the lodge. Over two hundred of these were reclaimed from the reserve�s road-and-facility building projects and integrated into Madikwe�s design. The sculpted forms of the buildings have been continued in the built-in vanities, slabs and fireplaces of the interiors; a practical consideration that also imparts a seamless quality to the spaces. The interior, by Conservation Corporation Africa�s creative director, Chris Browne, is a playful take on the traditional stoep (porch) culture so inherently associated with the Marico area, as it�s known locally (one of its most celebrated former residents was the writer Herman Charles Bosman, whose preferred subject matter was his beloved bushveld). A warm interior colour scheme of pumpkin, oxblood red and terracotta holds its own against the robust architecture with opulent copper accents in the form of artefacts, objets and elements integrated into the building, such as the woven copper screens that separate the bedrooms and bathrooms. As with the majority of Browne�s interiors, an easy-going mood prevails.Furniture tends to bear the patina of age and promotes the idea of informal lounging; an abundance of beanbags and cheeky woven banana-fibre chairs emphasise the laid-back message. 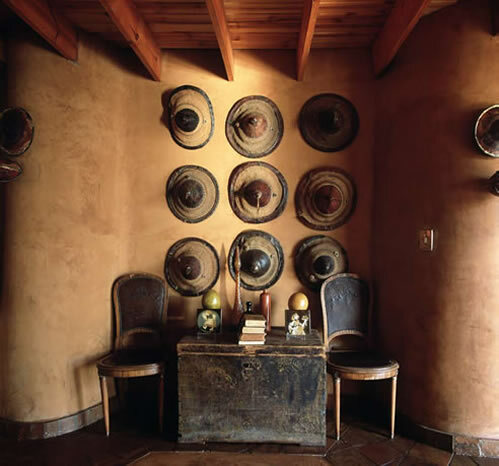 The inclusion of pan-African craft correlates to the geographical location of the lodge, which is near the Botswana border. Another Browne signature, a measure of quirk, can be found in the decorative flourishes: for example, the iconic South African advertising for a well-known brand of tobacco, transferred onto scatter cushions as a handstitched motif and bearing the warning �Danger: Smoking Kills�.